I remember the first time I saw Elijah’s Story. I had just given birth to my first child, I was exhausted, hormonal, and frustrated that nursing wasn’t the easy, natural experience I was promised. I desperately wanted to be discharged from the hospital so I could go home and get some real sleep without a nurse taking my blood pressure every hour. My nurse rushed through the discharge paperwork, but then made my husband and me stop and watch a movie about “shaken baby syndrome.” I wasn’t prepared for the impact Elijah and his story would have on my life. Elijah was a toddler who was violently shaken by his father and then died on Christmas Eve in 1997. 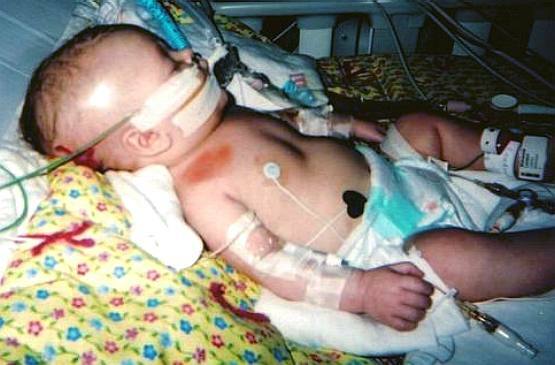 Watching Elijah’s loved ones talk about what happened to this beautiful boy was heart-breaking for my new mommy heart. A few months later I was the frustrated parent at my wit’s end. I was trying to transition my one year old daughter from a bottle to a sippy cup and she was not having it. I had worked a long shift at a very physically taxing job and my husband was gone at his job. I was home alone, exhausted, aggravated, and my toddler wouldn’t do the thing I needed her to do. I wanted to hurt her and those thoughts and feelings scared me. I remembered Elijah and I put her in her crib and walked away. I sat on the steps of my back porch and cried my eyes out while my baby cried her eyes out in her crib. We both survived that day because I took a deep breath, put her in a safe place, and walked away until I calmed down. Elijah’s story saved us both. Thirteen years later I was interviewing for a position at The National Center on Shaken Baby Syndrome. As a social worker and a CASA volunteer I was already committed to the safety of children and preventing child abuse and I was impressed with the Center’s commitment to keeping all babies safe from harm. In my research of the position I re-watched Elijah’s Story and remembered the impact it had on my life and the lives of my four children. I parented differently because I had been taught as a new parent through the Center’s mission of education and prevention how to control my anger and walk away before doing irreparable damage. I was excited to be hired to work for an organization that directly impacted my life and my children’s lives for the better. April is Child Abuse Prevention Month. Child abuse cuts across every socio-economic, racial, gender, and sexual orientation boundary. No community is immune from child abuse, but there are things we can do as individuals and parents to prevent it. The American Society for the Prevention of Child Abuse determined that the number one factor to combating child abuse is education through public awareness. Through education parents can learn coping mechanisms and skills that can help them deal with frustrating situations, like Elijah taught me to walk away and calm down. Keeping babies safe from harm is the belief statement of the Center and one I whole-heartedly embrace. My co-workers and I do this through our SBS prevention program, The Period of PURPLE Crying©, which teaches parents about normal infant crying patterns, how to soothe their babies, that crying is the number one trigger that leads to SBS, and how to cope with crying which can aggravate and stress out even the most well-rested parent. Parents and caregivers who understand that crying is a normal and healthy part of infancy can greatly reduce their own stress and frustration with incessant crying. The difference between a parent or caregiver who abuses a child and one who doesn’t is education, coping skills, and self-control. Prevention is our number one goal and education is the key. Shaking a baby can cause devastating injuries, which can include traumatic brain injuries and bleeding in the eyes. These injuries are seldom found together in any other kind of child abuse, medical condition or accidental trauma, and are often found with other child abuse injuries like bruising, broken ribs, broken long bones, and skull fractures. Sadly, 25 percent of all victims of SBS/AHT die as a direct result of their injuries. Those who do survive often suffer severe, lifelong disabilities including: learning disabilities, motor/cognitive difficulties, cerebral palsy, blindness, paralysis, or coma. While some of these activities may be dangerous and are not recommended, they will not likely cause SBS/AHT. However, I recommend parents have their children checked by a medical professional if they are worried. Doctors are never too busy to make sure your child is okay. At the very least, the visit will give parents peace of mind. Whenever I get a phone call from a parent or loved one who has lost a child to shaken baby syndrome, I often think of Elijah and how he would be in high school by now if he had lived, but because of an impulsive, split-second decision his father made out of aggravation and anger, his family will never get to see Elijah grow into the young man he could have become. So much potential was taken away in a split second and it all could have been prevented. Although his family has moved on and live full and complete lives, their grace in sharing Elijah’s Story with the world has benefitted thousands of parents, me included. Please, if you’re a parent do everything you can to keep your baby safe from harm. Take care of yourself, ask for help, walk away when you are frustrated, and remember Elijah and who he could have become if he had been allowed to grow up. To learn more about Shaken Baby Syndrome/Abusive Head Trauma please visit dontshake.org. If you suspect a child is being abused please call the National Child Abuse Hotline 1-800-4-A-CHILD. This post was featured on The Huffington Post.